This Tuesday 13th of September two brothers from Granada and with a very special story behind are preparing to begin a long journey to complete the distance between Roncesvalles and Santiago de Compostela. Oliver and Juan Luis, who have completed the last 60 kilometers of the Camino de Santiago together two years ago, now put the challenge of covering up to 800 kilometers in 37 stages, checking the status of accessibility of the French Way and recording it all for sharing their videos every day on social networks. The motivation? awareness of reality we face day by day all people with disabilities and reduced mobility, as Juan Luis, which has a 96% disability, so walking the French Way in wheelchair with the help of his brother Oliver . The two brothers have the support of the Association Accessibility for All "La Ciudad Accesible", in which Juan Luis is activist for the rights of persons with disabilities. The draft Oliver and Juan Luis, which seeks eventually "adapt and make available to all routes sendersimo, finally, can be traveled by people with disabilities" will catch finally form Tuesday when departing from Roncesvalles thanks to a small percentage to the contributions of those who collaborate selflessly, while the bulk of the donations will go to the association "La Ciudad Accesible". If you want to support Oliver and Juan Luis on his journey, and incidentally take a reward, you can do it here. Que bien! 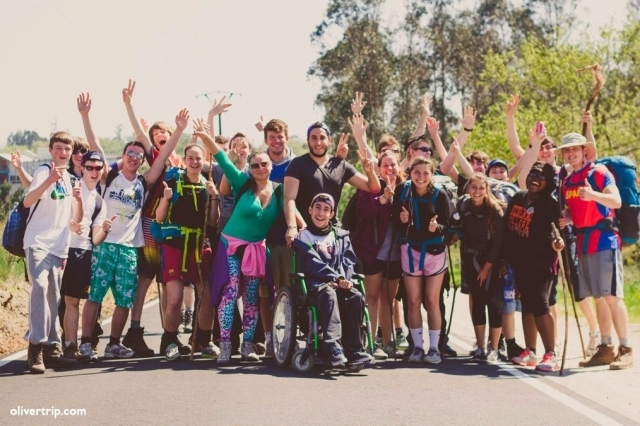 Que haya accesibilidad para todos en los caminos de santiago, mucha gente aún con alguna capacidad diferente tiene deseos de hacer cosas como cualquier vecino, felicidades a estas personas que se preocupan por ayudarles.